Fenerbahce Ulker Istanbul cruised to 85-68 win over Union Olimpija Ljubljana, taking an important step towards securing a Top 16 spot. Fenerbahce now hold 4-3 record, which puts it into a tie for second place in Group A, while Olimpija drops to 2-5 and must turn things around to have a realistic chance of advancing. Fueled with 11 points from Bojan Bogdanovic, the hosts made a 15-3 run early in the first quarter to take control. 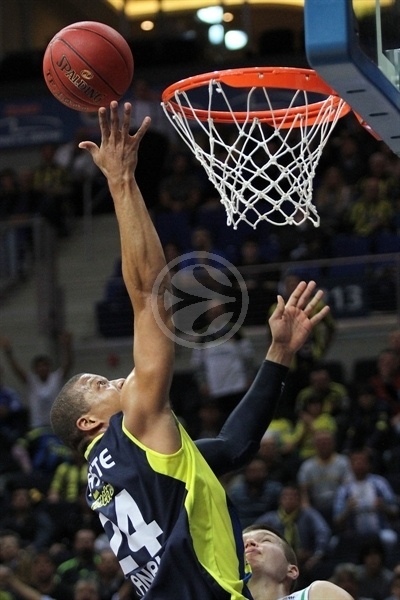 Fenerbahce maintained the lead in double figures throughout the game and sealed the deal with a 16-2 fourth quarter charge. Bogdanovic finished with 19 points, Bo McCalebb scored 13, Omer Onan had 12 and Emir Preldzic chipped in with 11 for Fenerbahce. Dylan Page led the visitors with a career high 23 points on 5-for-7 three-point shooting and Alen Omic amassed a double-double of 13 points and 13 rebounds, both career-highs. Among them Omic had 10 offensive rebounds, a club record, beating 9 by Aron Baynes, who also had a double-double with 10 points and 10 rebounds. 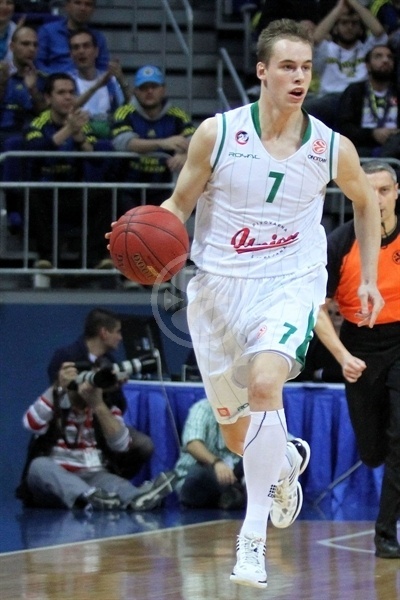 Page drove to the basket and Dominic Waters hit a jumper to give Olimpija an early lead. It took Fenerbahce more than three minutes to get on the scoreboard, but then Bogdanovic caught on fire, stringing together 11 points, including a jumper-plus-foul and a fastbreak layup. At the same time, Fenerbahce stepped up on defense, allowing only a triple by Page and forcing 6 turnovers. Steals by Romain Sato and Mike Batiste resulted in back-to-back easy fastbreak layups that made it 15-7 as the hosts took control of the game. Page hit another three to snap the run, however Bogdanovic made a jumper and McCalebb scored a couple of layups to make it 22-12 after the first quarter. Batiste opened the second quarter with a basket inside and McCalebb raced for a fastbreak layup to increase the lead to 26-12. Olimpija regrouped on offense, Baynes, Jaka Blazic and Drazen Bubnic went inside to score, but Emir Preldzic sank a triple and Batiste hit a baseline jumper on the way to 33-16. On the other end Klemen Prepelic hit a three and Alen Omic grabbed 5 offensive rebounds, but David Andersen hit a baseline jumper and Oguz Savas made a nifty move inside. The visitors tried to play high tempo offense, but their shots would not fall. Page scored a couple of layups, though, but not before Onan briefly made it a 19-point game and Fenerbahce went into halftime with a 43-26 advantage. Baynes’s slam-dunk and a Page layup got Olimpija going in the third quarter, however, McCallebb and Bogdanovic answered with layups. Page and Preldzic traded threes for 50-33 and the visitors could not come closer than 13 points despite a three from Page, a slam-dunk from Baynes and a couple of Dino Muric layups. In between Olimpija’s baskets, McCalebb had a basket-plus-foul and Andersen sank a triple, while Fener continued to cruise with Ilkan Karaman adding a monster dunk and a lovely reverse layup at the end of the quarter for a 64-48 lead going into the final 10 minutes. Page and Onan traded triples to start the fourth quarter and Prepelic hit a shot from downtown to make it 67-54 and give Olimpija a glimmer of hope. However, six different Fenerbahce players scored points on six of the following seven possessions, including a triple from Bogdanovic and fastbreak layups from Onan and McCalebb, making it 83-56. Omic hit 5 of 6 free throws to stop the run and added a layup-plus-foul to cut the deficit to 85-64 entering the final minute. Borna Rupnik and Omic rounded out the scoring, each making a pair of free throws as Olimpija finished the game on a 2-12 run. 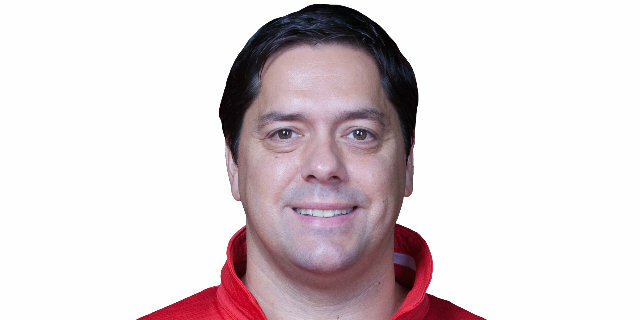 "It was a very critical win in a very critical period for us. Our energy was not at the desired level, but our intensity and desire to win is good enough. We had a good game and a comfortable win. We have been struggling with many injuries from the beginning of the season and couldn’t practice with a full roster. This is a good win that helps us to take a step further. And we can only become successful if we play the team game." 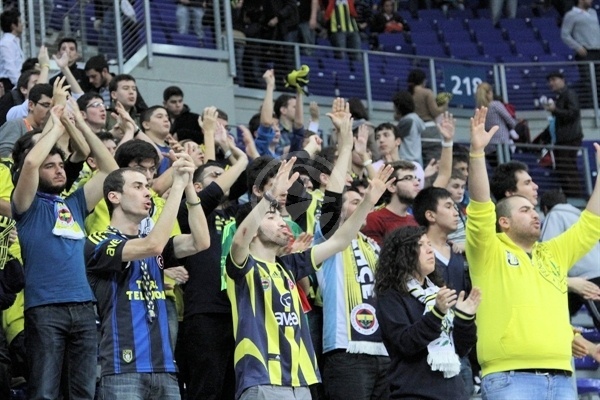 "First of all, congratulations to Fenerbahce Ulker for their well-deserved win. Tonight we lost against a very strong team and we couldn’t respond in the same way. We were better in rebounds and had second chances, but it means nothing when you miss. Anyway, we will be looking forward to digging in for the Top 16 in the next games." "This was a win which we needed very much. We lost two terrible games one after another. Our tough defense fired up our offense and we had a good margin in the first half. We extended it in the second half and in the middle of the last quarter, but ended the game by letting out an 12-2 run to Union Olimpija. If we can stop those things and remain resistant the whole game, then things will go much better for us."